The "surprise" comes from the unusual taste of preserved lemon. You can substitute fresh lemon juice and salt for the preserved lemon and the result will be tasty, but not surprising. 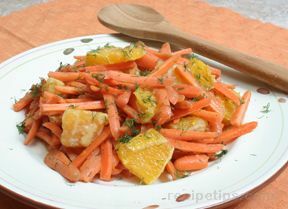 Peel and cut into julienne strips or grate 4 medium carrots. Wash well, core and finely dice 2 crisp apples. Leave the skin on for fiber and color. 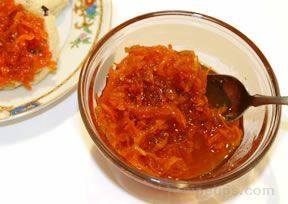 In a small bowl, mix together 1/2 cup plain yogurt, 2 teaspoons honey and 2 teaspoons very finely chopped preserved lemon. 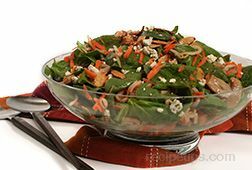 Don't rinse the lemon, since it is the source of the salt for the salad. 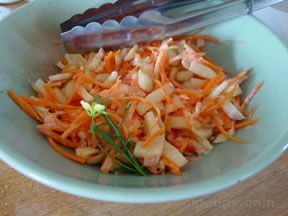 Pour this over the carrots and apples, and mix thoroughly. Garnish, if you wish, with chopped parsley.